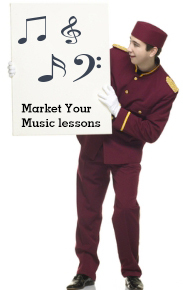 Finding unconventional ways to market your music lessons isn’t as hard as it may seem. The way to approach this situation is to look at your local community and think about how goods and services, particularly services, are marketed to the community. The odds are very high that your community has a plethora of ways that you can market your music lesson at little or no cost. In the fast paced age of the Internet and social networking, it would be easy to forget some of the old ways that people use to get the word out. Now, we are not suggesting that you hire a town crier and go about ringing a bell, instead let’s try a few ideas that are easier. One idea is to post advertisements wherever you can do so freely. Most of us can probably think of areas in our communities where we can post for free. Think about your local coffee shops, independently owned clothing stores and other establishments. Post enough advertisements for your music lessons, especially near schools and you will see results. Music stores and record shops could be the answer to your prayers. Stop in and talk to the staff in these establishments. Often, due to your shared love of music, they will not only let you post advertisements on bulletin boards, but in some cases you might even be able to leave flyers in a strategically placed location. The chances of this happening with an independently owned shop are actually pretty good. If you have a bit of an advertising budget, why not experiment and see if it is possible to have your flyers put into the bags and given to customers at music stores and record shops. You might find that this is a very easy way of finding new clients interested in music lessons, and the small business owner may appreciate the added revenue even if it is small. Internet cafes often have areas to leave and post flyers. They should not be overlooked, as they often have a good deal of traffic through their establishments on a given day. Much of the trick is to be persistent and friendly when interacting with these independent businesses in your area about your music lessons. But don’t overlook posting areas in more corporate establishments either like Starbucks bulletin boards, for example. Why not take advantage of these establishments? The worse thing that will happen is that no one will sign up for your music lessons and you will be in the same place that you were when you started. If you are too busy, hire an intern for a few hours a week and spot-check his or her work. Just one new client will more than pays for a intern’s hourly rate or flat rate. In short, think about where people congregate, such as a church or synagogue, for example. See if you can offer a special discount on music lessons to members of their congregation. You get the idea, get out there, and think about where the people are and how to reach them. You have a valuable service that benefits people, and there is no reason that they shouldn’t know about you! I would love to hear your comments and feedback! 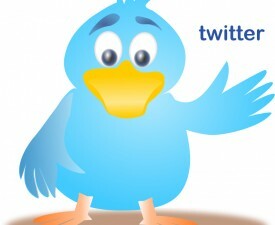 What ways have you found to market your teaching lessons? Taking advantage of all the Internet has to offer in terms of reaching people is vitally important for any business in general, and for music teachers more specifically. If you want the world to know about your music teaching skills, you should take full advantage of the promotion opportunities that are now available thanks to the Internet. There is a step that is critically important and really cannot be overlooked and that is having a music teaching website. 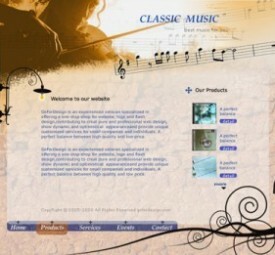 Every music teacher should have a music teaching website of their own, and the reasons for doing so are quite powerful.It does not matter if you are a piano teacher, guitar teacher, or drum teacher – every music teacher should have a website. If you are spending a good deal of time on the Internet working social networking sites or advertising your services on a site like Craigslist, then all of that traffic that you are generating should be headed to your website. Once people are on your website, they can learn more about you and the music teaching services you offer. Just how important is having your own website? Imagine for a moment that you are trying to decide between two music teachers, and one has a polished music teaching website and the other does not. Which would you choose? The answer is usually going to be the music teacher with the polished website with all other factors being relatively equal. The first step in making your website into reality is to carefully and thoughtfully laying out what it is that you want on the website. Your web text needs to be sharply written, concise and inviting. People should get a feel for you and what type of person you are. Due to the fact that your service is teaching in orientation, it is best that you give prospective clients some idea of what kind of teacher and what kind of music teaching style you have. Once you know what it is that you want on your website, you will need to find a designer. 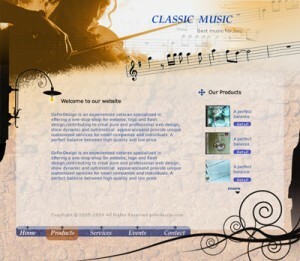 Finding a quality web designer is much easier than it used to be. There are sites where you can go to find a web designer with a proven track record. Be sure that you have studied their examples of past work. Make sure you check that the sites they have worked on are up and running smoothly. A polished website does not have to be mind-blowing or extremely fancy, but it does need to look professional. With a good website in place and proper utilization of social networking and other online advertising outlets, you should be able to see some new business flowing to your music teaching business in no time. 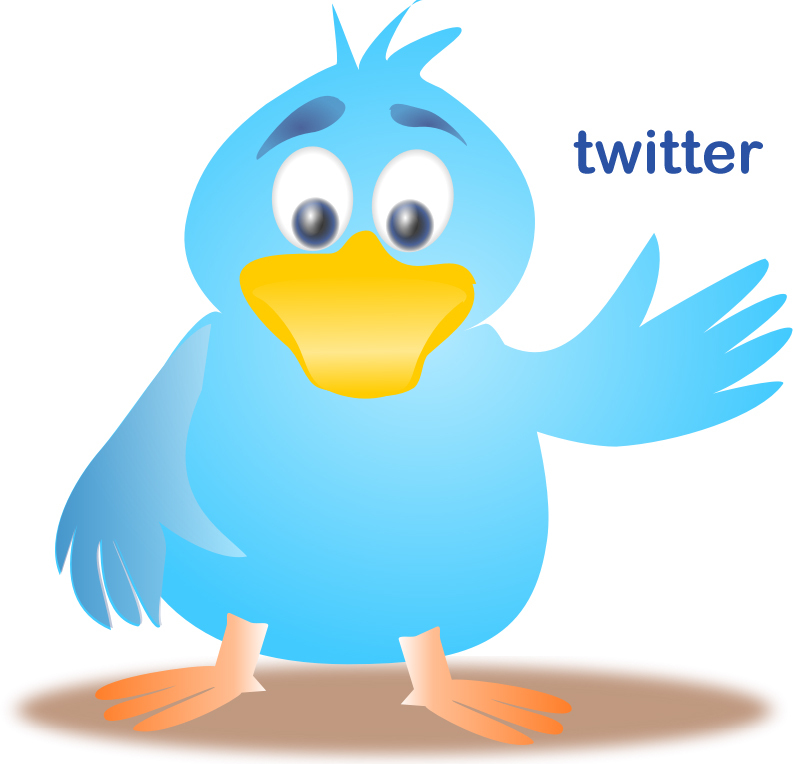 Take a minute and talk to me about your website. Do you have a website? How did you put it together, was it hard for you? If you do not have a website what are the problems that are stopping you from getting one put together? Here’s an idea on making music more accessible and fun. I always enjoy someone that thinks out of the box. I use the stairs leading up to my Studio to teach children about about steps and skips on the music staff. Each stair represents a half step on the keyboard. So the first stair is D, second stair, C#, next one D. I then do flash cards with letter names and the kids have to step up or down the stairs like a music staff saying the letter names of the flash cards out loud. You can also use the stairs as half steps and tell children to go up a third, down a second and use the stairs for interval work. If you are a guitar teacher pretend that each stair is a fret on the guitar. Are Books Dead for the Next Generation? You have to watch this video! I love the reversal and outcome of the video. A change of mindset, is exactly what we need when teaching. We are teaching music lessons for the next generation! These are our future teachers, music majors, concert lovers, and music appreciators. It is our job to reach them in the world they live, the world of technology that is ever changing. For the music teacher this can be done through avenues such as a computer labs, Facebook, recording technology. It is our job to connect with students and inspire them. I have been working on some new videos and blog posts centered around this very issue of working with in the “technology reality” of the current generation in order to educate, motivate, and inspire these children with what music is, where we have come from, where we are going and how to appreciate the past of music (the great classical composers) to understand the future. So give you opinion about today’s musical generation. I really think there is a place in this world for all music teachers to connect with their students, working through the students reality. Think about it – I heard on a new bit on National Public Radio about four years ago that said, we have finally graduated from high school a generation of children that have never not known what a computer is! A generation that has always had computers and technology in their daily life. – just food for thought! This is a great interview with Beth Klingenstein and Lee Galloway that I did at the National Music Teacher’s Conference in March. It serves a a great reminder for me to revisit my studio documents and make sure I have my communication in place when dealing with students. What kind of policies do you have in place for your music studio and private teaching? Do you allow last minute cancellations and make-up lessons? Do you charge students by the month for lessons or do they pay as they come? I would love to hear from you about your challenges and success when it comes to communicating with parents and students with your studio documents.